A warm welcome awaits you at Argyll Chalets and apartment from resident owners, Les and Michele Reay. Our family run self catering lodges and apartment are situated in the beautiful west coast of Scotland on the banks of Loch Awe, Portsonachan, Argyll, Scotland. We are pleased to offer a number of holiday loch side log cabins, in an outstanding location on the shores of Loch Awe or our apartment within Sonachan House. Argyll Chalets is situated in 5 acres of tranquil grounds on the southern shores of Loch Awe. This truly awe inspiring and peaceful location set in an area of breath-taking natural beauty is the perfect holiday choice for those looking for a more relaxed pace of life. Each log cabin comes complete with stunning loch views and covered veranda, to view the abundant local wildlife present on your doorstep. Often seen are deer, pine martens, foxes, otters, and red squirrels. Observe the bird life with regular views of ospreys, golden eagles, and sea eagles all in the vicinity. The area itself is an excellent base for exploring the Argyll and West Highlands. All four self-catered lodges comfortably sleep 4 people. 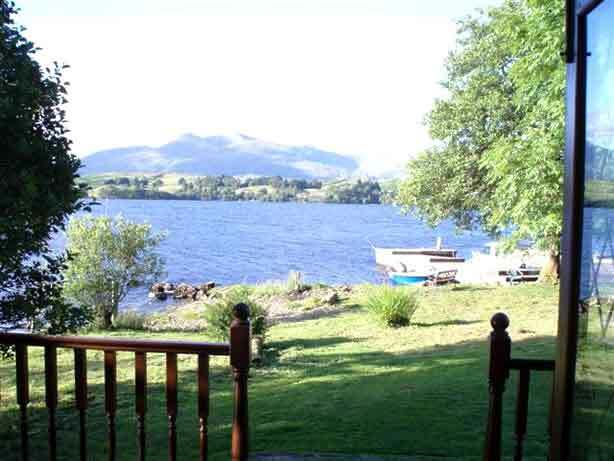 All lodges have stunning views out over the Loch towards the mountains beyond. Also available is the Kintyre apartment, ideal for couples looking for a getaway. The apartment is situated within the Victorian Sonachan House. Pet friendly accommodation - well-behaved pets welcome at no extra cost. Dog friendly accommodation for great family holidays with your pet. Accommodation is situated away from the quiet loch side road, creating a peaceful and safe environment for guests to enjoy. The ever-changing views over Loch Awe and Ben Cruachan Mountain make this a truly stunning location - at any time of the year. The surrounding Scottish Highlands provide a fantastic natural playground with forests, burns, mountains and lochs to explore and enjoy. Loch Awe features an abundance of walks, drives, local attractions and is a hugely popular destination for angling holidays. There are also many recreational activities available within the area - boat fishing for trout and salmon (permits available locally), golf, walking, horse riding, cycling and bird watching are but a few popular activities. Loch Awe is famous for its record brown trout (British Record), but is also home to rainbow trout, salmon, sea trout, monstrous pike, perch, eels, roach, and the 'rare' Arctic char. Situated on the shores of Loch Awe, Argyll Chalets offers access to the loch for fishing for no extra charge. Guests are welcome to bring their own boat or hire one locally from Loch Awe boats telephone 01866 833256 for prices and availability. Our loch side Scottish holiday cottages make an excellent base for touring Scotland. Visit the Scottish Highlands and Argyll's many gardens, castles and distilleries. Trips to picturesque Inveraray, Fort William, and historic Glencoe are recommended. The town of Oban is a short 35-minute drive away; from here, you can take a ferry to explore numerous islands such as Mull, Islay, Lismore, Tiree and many more. A local bar and hotel The Ardbrecknish House and the hotel with The Portsonachan Hotel, with eating facilities, is a short walk or a few minutes' drive from Argyll Chalets. Open all year round, Argyll Chalets are able to offer short last minute breaks and weekend breaks. Argyll Chalets comes highly recommended by all our guests who fall in love with the area so much that they return time after time. Visit us soon and become one of them. 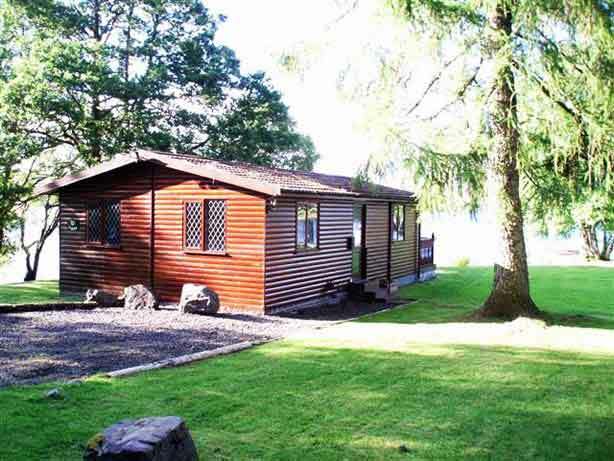 Lodges: These most attractive lodges are excellently situated on the loch side. The lodges have central heating and are welcoming and extremely comfortable. Kintyre Apartment:Recently restored and refurbished to the highest standards within Sonachan Mansion House. Ground floor apartment with garden views, only 2 minutes walk from the Loch.